The Harvest Moon is a time to gather crops. People have always been fascinated by the night sky. Giving names to constellations, stars, moon phases, and even specific full moons helps bring these celestial observances into everyday life. Hundreds of years ago, Native Americans living in what is now the eastern US kept track of seasons by naming full moons. Harvest Moon is the name they name gave to the full moon occurring closest to the Autumnal Equinox that marks the beginning of Autumn. Harvest Moon was named because it comes at the time when crops are ready to harvest and because the continuous light allows people to work into the night. Native Americans gathered their corn, pumpkins, squash, beans, and wild rice during the day and night of the Harvest Moon. Most Harvest Moons occur in September. But in 2009 the full moon closest to the Autumnal Equinox (September 22) occurs in October, on the 4th. The next October Harvest Moon won’t occur until 2017. The Harvest Moon, like other Autumn full moons, appears brighter because, rising before sunset, it gets more sunlight to reflect. 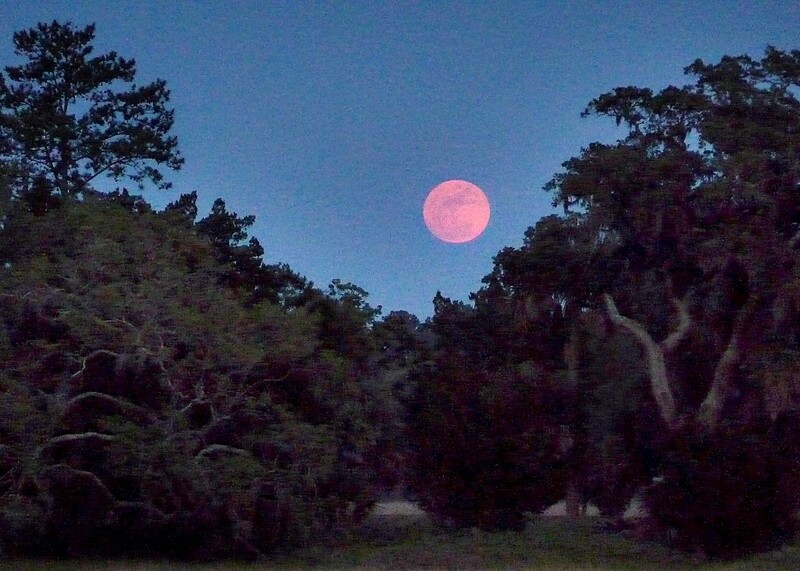 Rising Autumn moons also appear redder because of the seasonal tilt of the Earth. All rising full moons appear somewhat red because atmospheric particles scatter the blue components of the reflected light. After gathering crops, Native Americans turned their attention to hunting. So the full moon after the Harvest Moon became the Hunters’ Moon. Native Americans tracked deer and fox and set traps for beavers. The last moon in December is the Long Night Moon. The Winter Solstice, which marks the beginning of winter and comes on December 21 this year, is the shortest day and longest night of the year. The moon has its highest path across the sky and is above the horizon for the longest time. The Wolf Moon of January is named for the hungry wolf packs that howled outside villages during the long cold winter nights. After winter, spring is a time for planting. The March full moon is the Worm Moon because earthworms reappear as the ground softens. We know that “April Showers Bring May Flowers.” The Native Americans knew it too, naming the May full moon Flower Moon. Buck Moon is July’s full moon. It’s the time of year when male deer begin to grow their velvety new antlers. Blue Moon is something entirely different. Because the time between full moons (the lunation) is 29.5305882 days, sometimes there is an “extra” moon. Some months have 2 full moons instead of the usual 1, some seasons have 4 full moons instead of the usual 3, and some years have 13 full moons instead of the usual 12. The “extra” moon is the Blue Moon. But there is confusion about how to define which moon is the “extra” one. In 1937 the Maine Farmer’s Almanac named the 3 full moons in a season the early, mid, and late moons. In a season with 4 full moons, it defined the 3rd full moon as a Blue Moon, so that the last (4th) full moon could still be called the late moon. In 1946 a writer for Sky and Telescope magazine misinterpreted the almanac and wrote that the second full moon in a month was the Blue Moon. This definition was widely accepted until the error was discovered 53 years later by another writer for Sky and Telescope. So in 1999, the “official” definition of Blue Moon reverted to the original Maine Farmer’s Almanac definition. Seasons begin at Solstices and Equinoxes. Solstices mark the longest (Summer Solstice) and shortest (Winter Solstice) days of the year. Equinoxes (Autumnal and Vernal) mark the days midway between. In 2009-2010 in the northern hemisphere, the Autumnal Equinox is September 22; the Winter Solstice is December 21; the Vernal Equinox is March 20; and the Summer Solstice is June 21. The dates are opposite in the southern hemisphere. Happy Harvest Moon to you! Lynda Fox was a physicist at the Naval Research Lab working on solar spectroscopy before becoming a veterinarian. She is now retired and lives on Seabrook Island. Her first book A Wood Stork Grows Up was recently published.